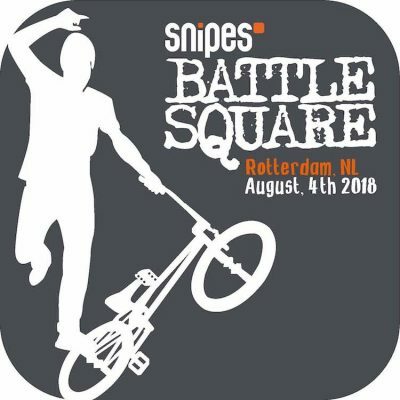 Cologne, July 20th, 2018 —SNIPES Battle Square is bringing both a NEW BMX Flatland event and a fundamentally new event format to Rotterdam. – On Saturday, August 4, 2018, 14­ of the world’s best professional BMX Flatland athletes together with OPEN Class amateur riders will be competing and showing spectacular moves and tricks on their BMX bikes. This fascinating freestyle discipline represents the symbiosis of BMX riding and Breakdancing. One day loaded with the “Best of the Best” in the sport — 14 BMX Flatland riders from the Netherlands, USA, Canada, Spain, France, Czech Republic, England, and Germany will compete against each other and fight to win a total of EUR 7,500 prize money. The athletes will be performing to various types of music and to the voice of one of the best MC’s in BMX: Zach “Catfish” Yankush from USA.